An efficient and cost-effective satellite launch platform could soon be a reality in Australia thanks to a world first engine that's being developed by University of Sydney combustion experts. 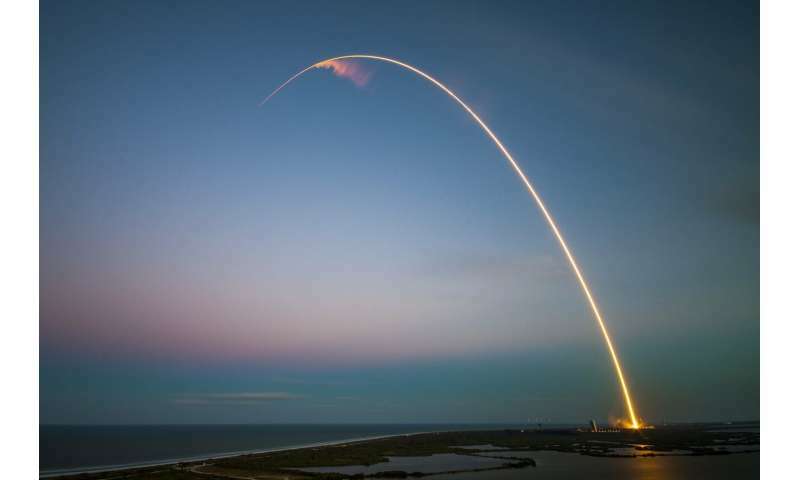 As part of a global industry research project, combustion experts from the University of Sydney's School of Aerospace, Mechanical and Mechatronic Engineering are one step closer to developing a more efficient and cost-effective access to space platform for satellite launches. Making up the University's Clean Combustion Group, Associate Professor Matthew Cleary, Associate Professor Ben Thornber, and Dr Dries Verstraete have joined the International Responsive Access to Space project, with the aim of building the world's first successful rotating detonation engine to send payloads into space. Led by DefendTex, the project was awarded a $3million CRC-P grant in 2018 as a federal government investment into developing Australia's space industry. The project includes researchers from the University of Sydney, Universität der Bundeswehr München, the University of South Australia, RMIT, Defence Science and Technology Group and Innosync Pty. Associate Professor Cleary's group has focused its research on combustion and has initiated computational fluid dynamics simulations, with preliminary results demonstrating the efficacy of the rotating detonation engine. The group also includes three aerospace engineering researchers who are working on launch system conceptual design and rotating detonation cycle performance and efficiency analysis. "Since the project kicked off we have worked with our collaborators to develop new computational methods to investigate supersonic combustion, which is a process known as detonation," explained Associate Professor Cleary. "Our preliminary findings from simulations of a model rotating detonation engine have led to some interesting findings about the stability of detonations in an annular channel, in particular with regard to the importance of designing the combustor geometry such that the detonation is stable and rocket thrust can be sustained continuously. This information is being fed to our collaborators who are now starting work on ground testing an engine," he said. While conventional rockets carry both oxygen and fuel onboard, the team has been researching methods for rockets to effectively collect oxygen from the atmosphere during lower atmospheric ascent. "The purpose of this function is to reduce the mass of the launch vehicle and increase efficiency, reduce costs, and potentially allow for larger payloads, such as satellites." Professor Christian Mundt from the Universität der Bundeswehr München has been working closely with Associate Professor Cleary's team and will be performing simulations to test the engine's air breathing function. "The propulsion concept of the rotating detonation engine is very promising for the future because of its cycle advantages—we are very glad to be part of this important research project," said Professor Mundt. With increased global investment in space technology and commercial satellites, Associate Professor Ben Thornber believes the project is well placed to make a substantive impact on Australia's space economy. "Our advancement of modelling of high-speed propulsion is directly aligned to Australia's strategic investment in a space agency, and aims to enable Australian industry to access the small satellite launch market, which is valued at $16billion over the next decade," he explained. DefendTex's Chief Executive Officer, Travis Reddy believes the current research is on track to developing "a world first Rotating Detonation Engine capable of providing Australia's first sovereign launch capability for Responsive Access to Space".